It’s hard to imagine a more elegant style than that of the ancient east. Their sophisticated architecture and designs have impressed people around the world and throughout time. A marriage of beauty and simplicity, it’s easy to see why they are often said to be in a class of their own. When it comes to jewelry and especially gemstones, the east has a particularly unique perspective — especially in countries like India. 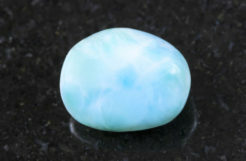 So unique, in fact, that gemstones are often recommended to those going through a difficult time. A period of karma, they say, can be mitigated by wearing the appropriate gemstone. 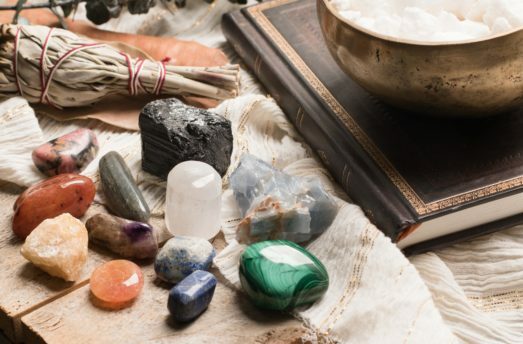 Whether it be rubies, moonstones, or even diamonds, they’re all placed in contact or near-contact with the skin to extract their healing vibrations. This gorgeous jewelry below was handmade in India. The eastern design influence of simplicity and elegance can be seen in every piece and will be sure to get the attention of anyone that happens to glance at it. The gemstones used in the jewelry are said to have those very same healing qualities. It’s a synergy of beauty and power! Labradorite – One of the most beautiful naturally-occurring stones, labradorite opens the mind and raises consciousness. 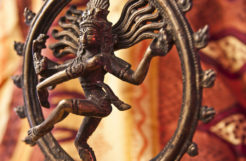 It aids the wearer in feeling universal energy and repels negative energy. This naturally gives way to deeper introspection in all aspects of life. 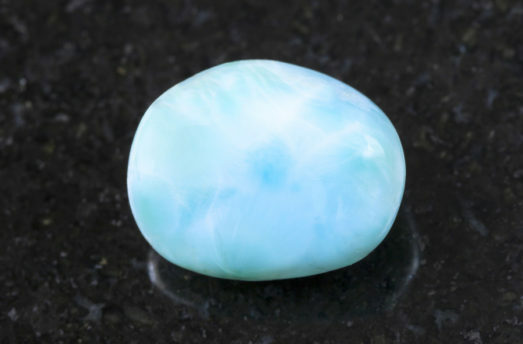 This is an extremely mystical gemstone! 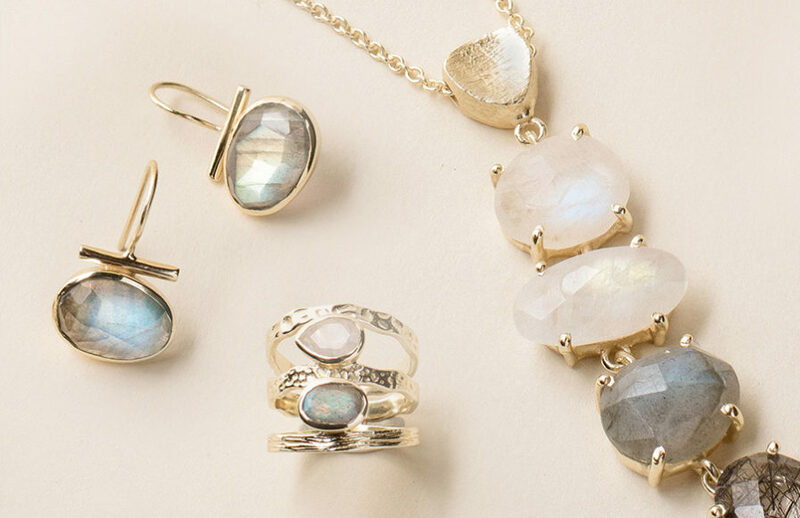 Moonstone – Long ago, Romans believed moonstones were the rays of the moon solidified in rock. it’s easy to see why — bright, reflective, and beautiful. Moonstone is reflective and represents the feminine energies, increasing intuition and empathy while calming emotional turmoil. 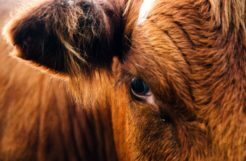 Ruby – Ruby is the limitation-breaker. 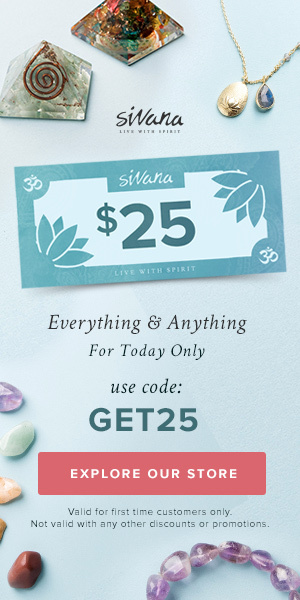 It shields against negative energy and strengthens joy, bravery, and leadership skills. It also boosts a serviceful attitude in spiritual activities. 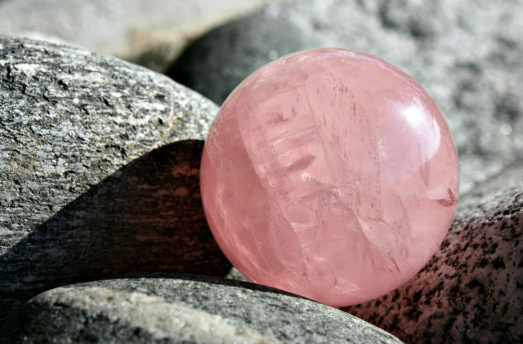 Rose Quartz – Rose quartz is the stone of love and peace. It opens the heart by helping to circulate the Divine pranic energy of the Heart Chakra. It’s especially helpful in relationships because it brings a sense of inner personal fulfillment — i.e. 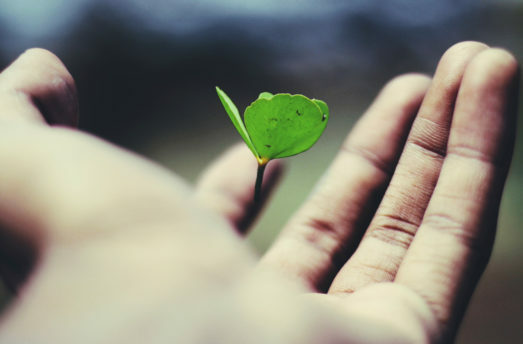 knowledge of our own self-sustaining love. Tiny but mighty! 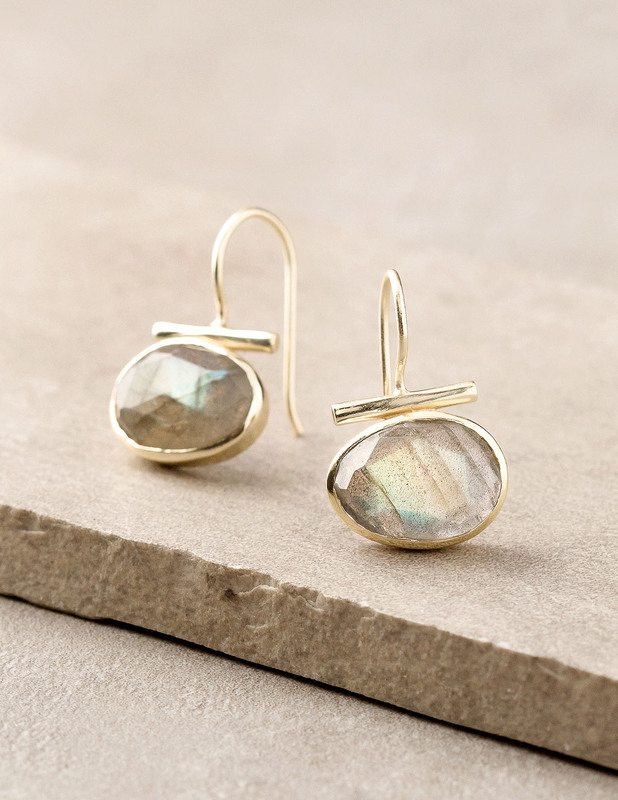 These beautiful earrings will give you the subtle glimmer you’ve been looking for. Elegant yet bold, it completes any look. 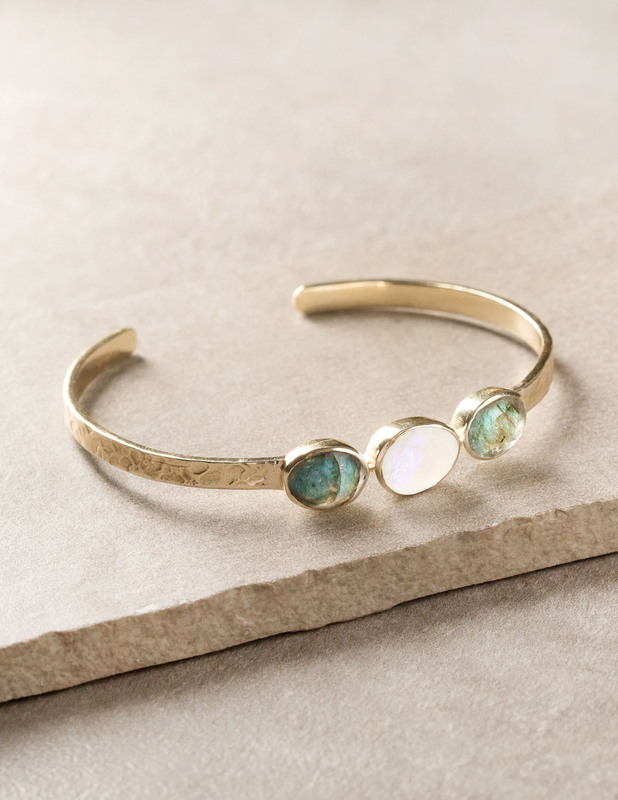 Hand-hammered gold supports moonstone between two iridescent labradorite gems, making this bracelet mesmerizing. It shines with a light of its own! 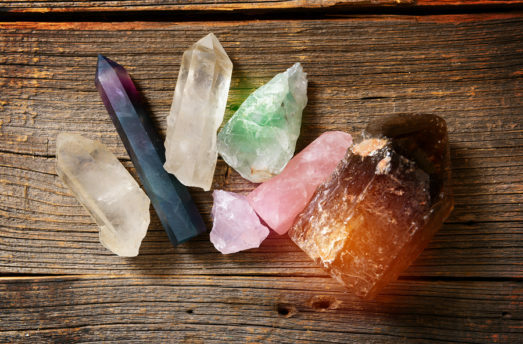 Find your destiny by tuning into the power of your intuition using moonstone! 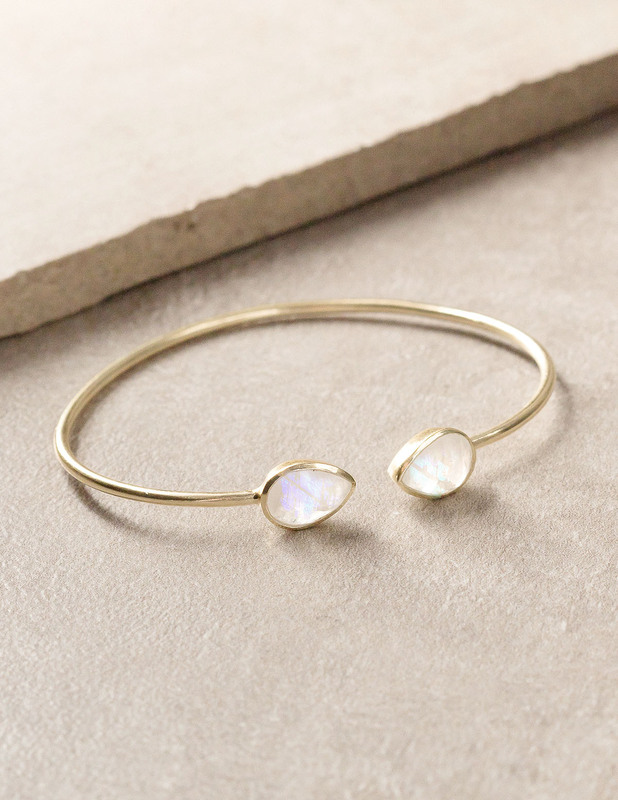 Two of these captivating gemstones sit together on opposite ends of a subtle gold band. Hammered with a small tool, this gold-plated brass holds moonstone and labradorite in a unique setting. 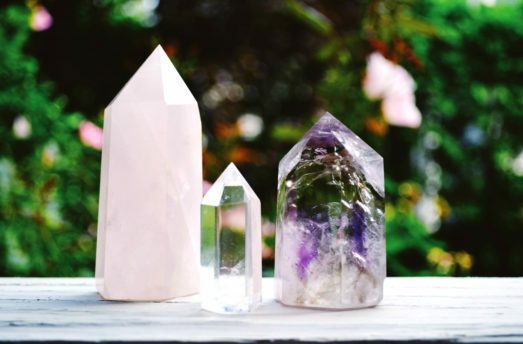 These iridescent stones are striking and powerful. 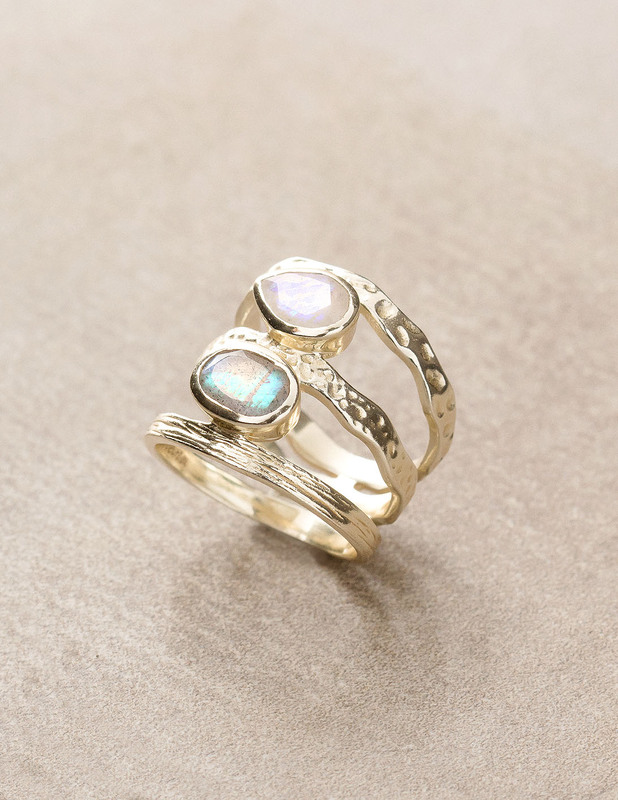 Labradorite sits tranquilly between two small moonstones in a faceted gold band. 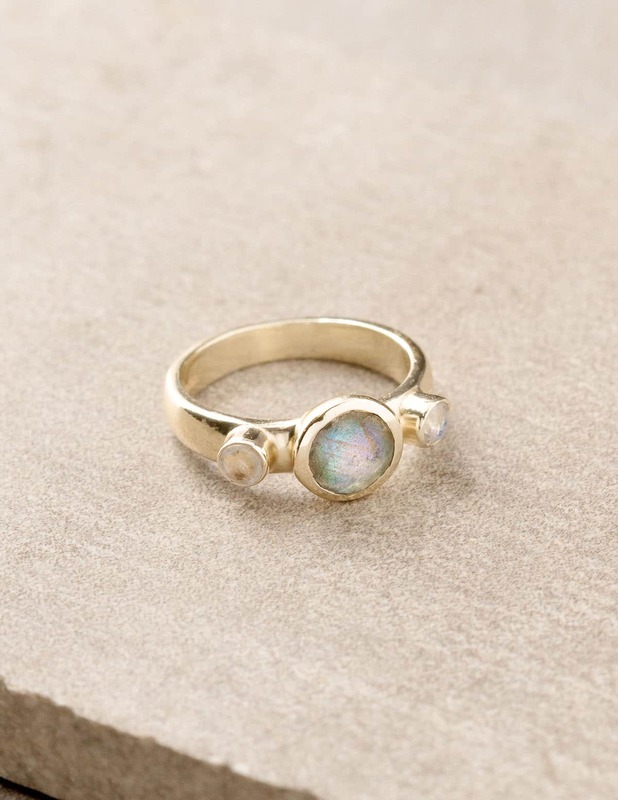 When caught in the light, this ring shimmers with spiritual energy. A subtle gradient from light to dark red ruby makes this necklace striking. 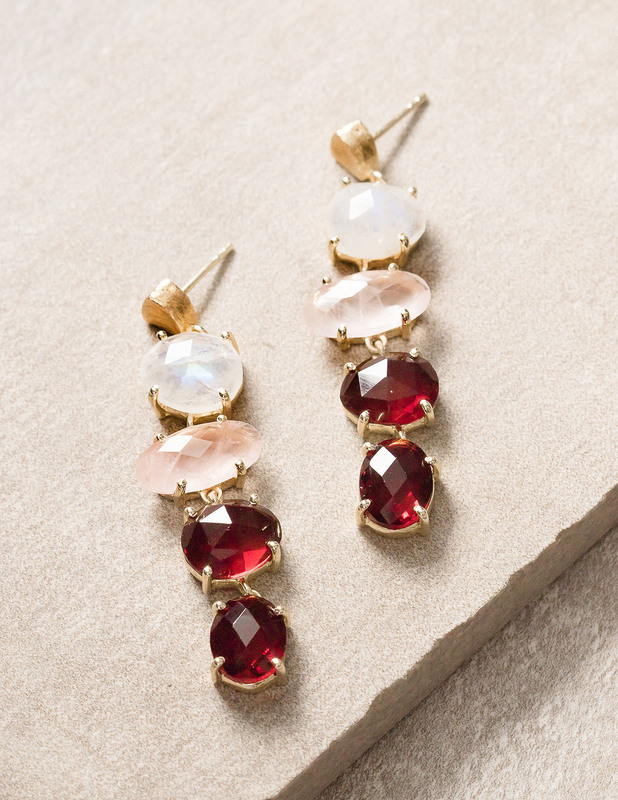 Moonstone, rose quartz, and ruby are held by gold-laced brass. Not only does it bring class and elegance to an outfit, but rests at the heart — exactly where it should be, energetically speaking. 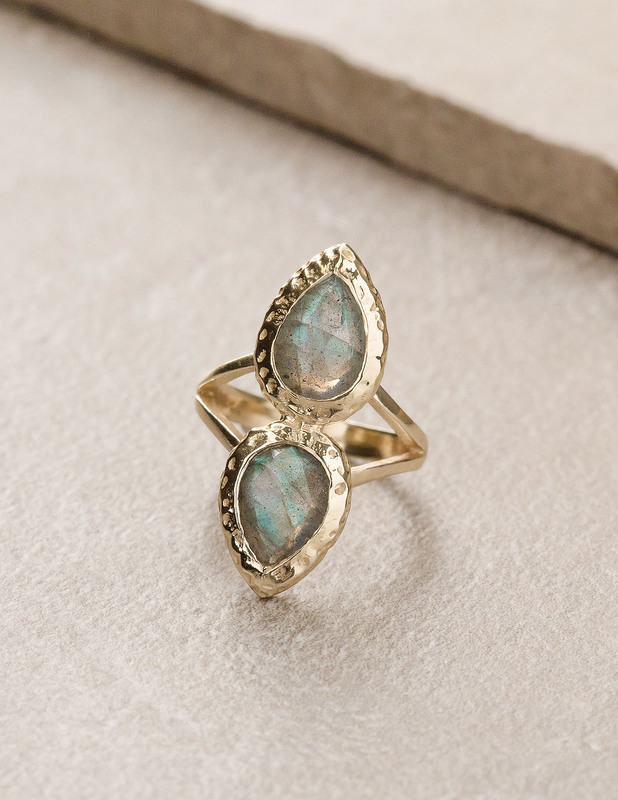 A truly unique ring, two labradorite teardrop pieces sit on opposite sides of one another, evoking imagery of balance and duality. Similar to the ‘Through it All’ necklace, these earrings are sure to generate interest from everyone who lays eyes on them and add sparkle to any outfit. 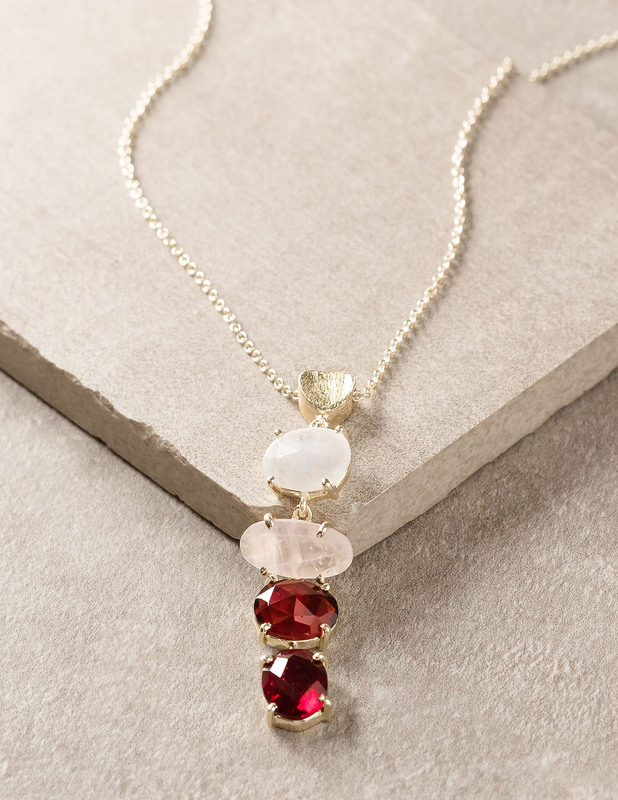 Stunning gold encapsulates moonstone, rose quartz, and ruby.